The initial order of Chamber business Thursday was election of 2007 officers including Terry Due (president), Bill Roten (president elect), Stacy Brown (vice president) and Billie Francis (Sec-Tres). The installation of officers will take place at the awards banquet Jan. 20th. Cherokee Chief Chad Smith will be the leynote speaker at that banquet. 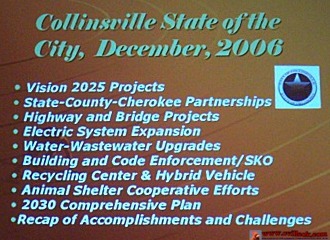 The two charts at right show just a sample of the City of Collinsville topics and accomplishments discussed by City Manager Pam Polk at the Chamber's monthly meeting Dec. 7th. Pam reported that both a Quick Trip and a Sonic have announced plans to open in the future within the Collinsville sales tax area at Highway 75 & 20 west of town. Pam also reported that Kelly Young had been hired as the new city clerk reporting Dec. 21st. Detailed status on several pending projects is still sketchy. 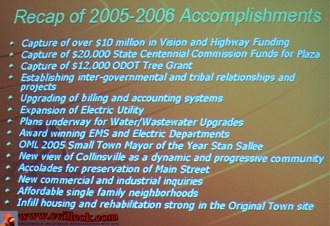 Mayor Sallee reported material delivery for the Broadway bridge is scheduled for Jan 2007. City Manager Polk reported the TEA-21 Downtown Beautification construction might begin in Feb. 2007. Mayor Stan Sallee reported he is building a "wish list" of Collinsville needs for an upcoming appropriations "lobbying" trip to Washington, D.C. Three examples given were a jail, a fire truck and an ambulance. The Mayor also reported City employees logged 70 hours of overtime clearing streets during the recent snow storm.